Macbeth, by virtue of its perennial presence on the national curriculum and its pulpy plot that might just possibly hold the attention of recalcitrant teenagers who would rather be playing Call of Duty than sitting in a darkened theatre listening to verse-speaking for over two hours, is a Shakespeare play that never seems far from reach. It also has the added advantage of lead role that can be tailored to actors as apart in their careers as Kenneth Branagh and James McAvoy. This sense of over-familiarity has harmed the play’s standing in the canon of Shakespearian tragedy, where it is rarely considered to be on the same level as Hamlet and King Lear. This distinction is hard to deny if the sole value for the tragedies is driven by the psychological complexity of its lead characters. However in Macbeth, which post-dates both plays, Shakespeare seem less interested in this then it exploring man as a primal force of nature. Where Hamlet ruminates on the moral legit imacy of his actions and the imperatives that drive him, Macbeth is driven by the emotion that eventually subsumes him – the tragedy lies precisely in this lack of reflection. One of the joys of Macbeth for a director is that it provides an appealingly blank canvas; the landscape is sketched out as roughly as the country it is set in, and the setting is not tied to any significant fixed points in history. The result allows freedom for the director to overlay an idea onto the play without destroying the sheer enjoyment of Macbeth’s whirlwind central performance. Jamie Lloyd’s production embraces the wild and primitive nature of the text – it is a Macbeth that lives and breathes the visceral and savage world in which it is set. There is no re-imagining Macbeth as a modern-day dictator or gangland crime boss; this is a Macbeth of history but a history that is rarely seen – when kings were a long way from assuming a divine right and living in a world of pomp and pageantry. In this Macbeth, you are king in so far as you assert a brutal right to supremacy. You are king of what you can hold and no further. At its heart is Hobbes’ maxim that life without a settled community is a life of ‘continual fear, and danger of violent death, and the life of man, solitary, poor, nasty, brutish and short’. The set could be described as post-apocalyptic, post-climate change, post-fall of civilisation but it could easily reflect the nature of Britain prior to the establishment of a settled state. It is dank, dirty and decaying, and suits the purposes of those rule it. From the outset it is clear that these hard men living in hard times; when Duncan exclaims ‘what bloody man is that?’ [I.ii] it is not out of concern for his condition but out of wariness over his allegiance. Until Malcolm confirms that he is the Sargent he is welcomed only by the barrel of a rifle. Similarly when Duncan reaches Glamis it seems more in keeping with a temporary base of a raging civil war; people sit on fold-up chairs and the ‘throne’, in a playful twist, is a toilet. The castle stands as a base of operations and nothing further. These men embody thec tribes forced north of the wall centuries earlier by the Romans than the contrasting civilisation of southern England. A point made by Lloyd as he bathes the set in an almost spiritual light during the play’s foray south of the border to hear Macduff and Malcolm debate the values of kingship. This imagined world revolves around Spinoza’s belief that ‘peace is not the absence of war, but a virtue based on strength of character’. The play begins as war is concluded and the opportunity for peace to descend, yet it appears inevitable that it will only act as a temporary cessation of hostilities. It is so embedded that Macduff, who represents the forces of moral legitimacy, ultimately fails to demonstrate the virtues that can allow peace to flourish. The stark imagery of Macduff lifting Macbeth’s severed head above his own, face slowly covered by the blood of the defeated King, resembles the savagery of all that was fought against than the kingly virtues that Malcolm extols. 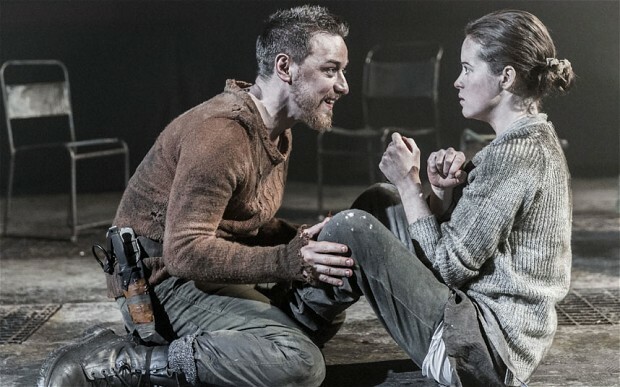 It is essential to understand that McAvoy’s Macbeth exists against this backdrop, as it is an explanation to the question of why Macbeth cannot turn away once he has achieved everything that was promised to him. Even before the Witches’ promise him the title of King it seems apparent that this Macbeth would not have been satisfied with his lot. Like those around him, he is a man of war and his achievements breed an emptiness rather than satisfaction. The idea that Macbeth is already conscious of his desire for greater power is one of the central conceits that runs throughout the play and features strongly in the interpretation of the ‘three witches’. Lloyd’s production seems to focus on an important distinction in the meaning behind Banquo’s ‘Good Sir, why do you start; and seem to fear / things that do sound so fair?… [I.iii], with it being directed to Macbeth not due to his surprise at the revelations but rather towards the fact that Macbeth appears jolted by the fact that the witches have spoken aloud thoughts that have hitherto remained internal to himself. By playing the witches closer to the Old English understanding ‘weird sisters’, meaning something closer to the Greek Fates, Lloyd has indicated that what we hear is closer to a vocalisation of plans Macbeth has previously run over in his mind. The witches are embedding in Macbeth’s head titles that he already mentally bestowed upon himself. Given that he exists in a world of shifting allegiances and is already a trusted and senior figure it is not surprising that he has considered the potential angles for himself. This idea is given more weight by the most visually arresting scene of the production in which Macbeth summons the witches. Rather than have the dialogue delivered by the witches, Lloyd has the spirits ‘possess’ Macbeth; in essence the words spill out of McAvoy so that he becomes both interrogator and interrogated. It appears to make the case that Macbeth, even within the constructs of Shakespeare’s narrative, cannot be considered invincible even if danger is limited to the tightly constrained circumstances detailed by the spirits. However by issuing from within Macbeth, the audience are left with the intriguing notion that this is part-psychology. It is his own consciousness detailing the parameters by which he must inevitably be defeated. It is even pre-figured in the previous scene after the exit of Banquo’s ghost when Macbeth states that ‘…they say that blood will have blood: / stones have been known to move, and trees to speak… [III.iv]. In Macbeth’s fevered state he is already turning over the ideas that lead to the imagery of a forest rising up against his barbarity. Following from making Macbeth more of a character of his own making rather than someone who is pushed to actions by others helps to solve one of the long-standing challenges in Macbeth – how to make a convincing character out of Lady Macbeth. It is relatively straight-forward to put in a solid, actorly performance, as the part contains some of Shakespeare’s richest dialogue for women but it is much more difficult to provide a coherent transition from the Lady Macbeth of pre-interval to the Lady Macbeth of the post-interval. The problem lies primarily with Shakespeare, who does not give enough to justify the switch from controlling force to damaged personality. However by making Lady Macbeth be much less of a driving force behind Macbeth’s actions it manages to side-step some of these issues. Their relationship from the start is shown to be one of equals. Whilst she does not match Macbeth’s love of savagery, it is clear that Claire Foy’s Lady Macbeth has the wild about her. McAvoy’s Macbeth does not seem the type to marry a classical noblewoman, or be challenged by a manipulative wife. Foy’s Lady Macbeth is an equal partner, who embraces and encourages his savagery, but makes a fundamental error in assuming that she can retain some control of his wilder nature. During Banquo’s ghost scene the horror that we see in Lady Macbeth is not one of concern that Macbeth’s ravings may lead to the discovery of their actions but rather a realisation that she has helped to unleash something that she can longer control. Foy’s face when McAvoy’s Macbeth states that ‘…I am in blood / Stept so far , that ,should I wade no more / returning would be as tedious as go o’er…’ [III.iv] is one of stunned horror, a realisation that Macbeth will not return from his path and it will be as bloody as the one that he has come down. This is a pivotal moment in the transition of Lady Macbeth, as from this moment she is caught up in the sins that have been committed; for Macbeth the price is that he must continue, but Lady Macbeth can only turn back and the tedium that she encounters is the reliving of that night and the madness made manifest in the continual washing of her hands. This production is full of neat touches that add pace to what is lengthy version of the play. Modern practice appears to take a cleaver to the text but Lloyd runs it pretty much to the hilt and as such it clocks in at two three-quarter hours. This length is broadly allayed by the sheer visceral nature of the performances, rarely has Shakespeare appeared this gripping. There is vigour to all the scenes – with actors rarely entering at any less than full pelt and dialogue that is spat out with a rat-a-tat-tat velocity that really propels the action along. It is an excellent decision to make use of McAvoy’s natural Scottish accent and have the cast speak in a thick Scottish brogue. It instantly places the play north of the boarder, giving it more of a sense of a fixed location and providing a harder edge to the dialogue. The classical tradition does Macbeth a disservice as the beauty of the language can cause one to lose sight of the brutality of the action. 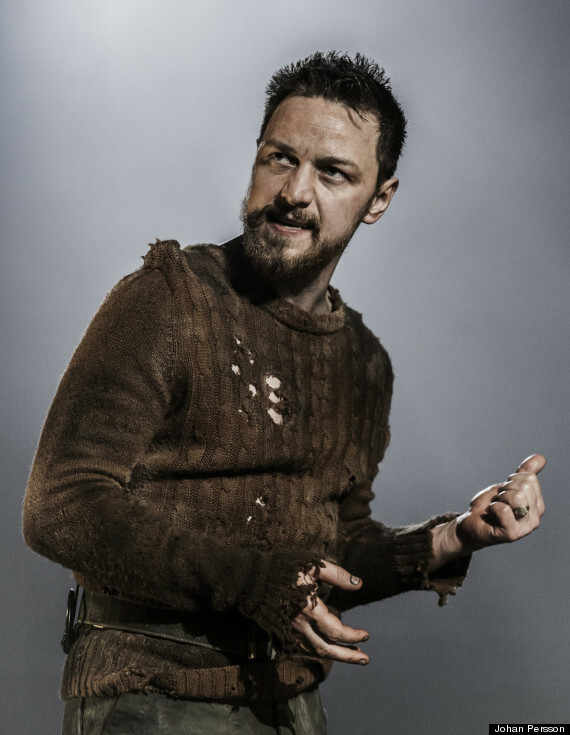 McAvoy is strong in the role and it seems as if his time in Hollywood has benefitted him, providing him with a natural presence that is in keeping with the swaggering, whirlwind force of Macbeth’s personality. He commands the stage and is constantly in motion, helping to ensure the pace of the production never drops. It is a focused performance and one of the most energetic that will be seen on stage this year. His dynamic with Foy is a highlight of the production, and whilst it may not match the sheer brilliance of Patrick Stewart and Kate Fleetwood in the same roles, there is a core of truth to their relationship that many productions fail to reach. Foy has created a Lady Macbeth of verve and audacity, and there is a believable truth that she fits into this world and has been hardened by the steel of war, yet with skill Foy demonstrates that Lady Macbeth is constrained by a moral limit that she might not have realised she had. This Macbeth sits happily in the very large canon of Macbeth’s. It has been the hot ticket in London this year, although that may have had something to do with the star wattage of the lead as much as the production itself. Whether it ultimately remains in the memory may in fact be determined elsewhere, with Branagh’s return to the stage at the Manchester International Festival possibly proving to be THE ticket of the year. Jamie Lloyd should take credit for finding ways to challenge some pre-conceived notions about how the characters should be played and attempting to elevate its status among the tragedies.